September is going to be chock-full of big releases, including a spin on a classic, a new edition of a veteran in our lineup, a classic reprint, and a brand-new dexterity game. Let's get into it! Take the scenic route with a new way to play any Munchkin game! 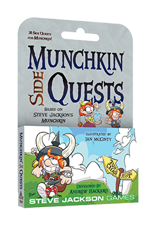 When you need a short detour from the business of killing monsters and betraying your friends, try Munchkin Side Quests! 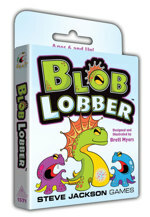 This 30-card expansion can be added to any of your Munchkin games, and it's illustrated by Ian McGinty (who has previously drawn for the Munchkin Collectible Card Game and Munchkin Magical Mess). Get secret in-game goals that you can complete to cash in for a reward AND, just maybe, surprise everyone with a new way to win the game! 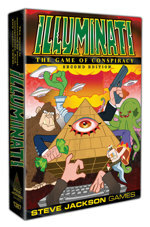 The classic game of conspiracies gets an update and face lift! This second edition updates some references and gives a pulpy, graphical revamp courtesy of Lar DeSouza (Super Munchkin Guest Artist Edition, Munchkin Collectible Card Game). SPANC is back in print, just in time for the 10th anniversary!